"From Black Tie to Backyard Bar-B-Que's.........We Do It All"
Few locations on the planet have as strong a sense of place as Louisiana. When you think of Louisiana, you think of the culture, the music and, above all, the food. Catering Connection began operation in 1996 when Tip Pace, owner of Feliciana Seafood Market, acted on his customers’ requests by opening up a catering business. Catering Connection takes the same quality foods that made Tip’s other food and beverage establishments a hit and brings them to any catered affair. It takes a lot of hard work for a restaurant to distinguish itself in a food culture, but soon after Catering Connection opened, it quickly became a beloved local institution to the Baton Rouge Area, and the surrounding towns of St. Francisville, New Roads and Zachary. At Catering Connection, we pride ourselves on the meals we serve, and we aim to serve them to as many people as possible. Our specialties cover all of the Louisiana staples including: jambalaya, barbecue, fish fry's and the seafood boil.Whatever your favorite food is (Black Tie to Backyard BBQ), if you can't find it on our menu, then call us & we can make it happen.Catering Connection is a Baton Rouge area catering company that brings the pleasures of Louisiana cuisines of seafood, barbecue and all types of creole and cajun delights to any event. We offer a wide array of menu choices and a complete range of services. We do events from wedding catering, special events, corporate events in the Baton Rouge area like backyard seafood boils in Zachary to BBQ’s in New Roads and fish fry's in Gonzales. 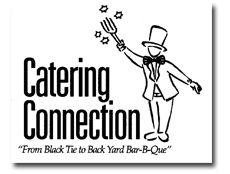 We cater any event; from black tie to the back yard......We do it all! At Catering Connection, we work hard to make your catered event a delightful experience. Baton Rouge, St.Francisville, Natchez, Denham Springs, Gonzales and all over Louisiana and Mississippi locations! Event Planning, Logistics, Catering and equipment rentals with tents, tables and chairs too!